It’s about the bottom of the second inning of the 90 day treadmill we call earnings season, and so far it looks pretty good. Managers are executing well, given the continued slow growth economy that continues. 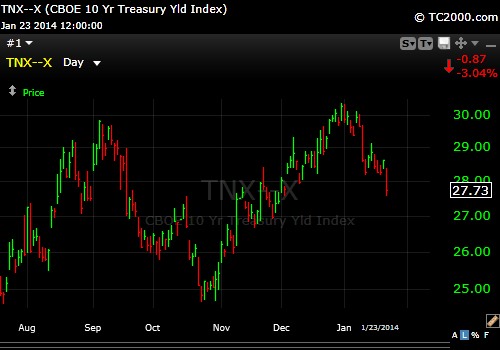 While earnings as mentioned above in our opening are doing ok, bonds are telling a more conservative story. Lower interest rates, higher bond prices infer a slowing. With a very weak recent non-farm payroll number (75k actual versus 175k expected) and a few weaker China economic numbers, the bond guys are … at least at this point (pretty short-term, so maybe just a glitch, but we are watching) leaning towards a slower future. The good news is time will let us know who is correct. Looking into the next several weeks, the weekend’s look rather full as the calendar shows travels ahead. This weekend in fact, is packed full of fun with sports, several meetings, and some rest time with the family before the travels ensue. Have a Great Weekend and a Super Friday! This entry was posted in Earnings Season, Investing/Financial Planning, Market Comments and tagged Bonds, Earnings, Interest Rates. Bookmark the permalink.